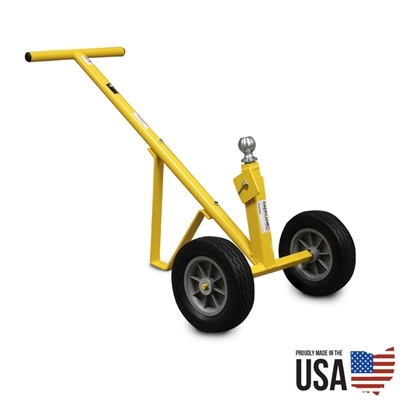 American Cart has been developing hand trucks since it’s beginning in 1997. Customer requests have lead to many of hand trucks we offer. We take those ideas and continually improve on them, developing even stronger carts with even more features. The Fork Hand Truck is a great example of that. It started as a simple idea and has now turned into one of our best selling carts. The heavy duty Trailer Dolly is rock solid and has separated itself from the competition. The heavy duty Fork Hand Truck from American Cart is a true workhorse. The cart can be used across a wide va riety of applications from mini pallets to material handling. The solid steel forks are adjustable providing infinite positions. This ensures the load is balanced and secured during all parts of the transport. The hand truck is dependable and ready for a full day of use. The flat free tires never need to be pumped up. The standard 3/4″ axle diameter leads the industry and provides improved durability. Usability is a top feature on this fork truck. The two handles are angled to provide a perfect ergonomic grip for handling loads. The P-handle provides a more traditional position for lighter loads. Adjustable Forks – The forks can be moved at any point along the 20 inch width of the cart. Ergonomic Handles – The hand grips are angled to provide the optimum position for carrying heavy loads. Powder Coated Finish – Protects the cart and keeps it looking great for years. The American Cart Trailer Dolly is heavy duty. Every component of the cart is built for maximum strength and durability. The 3/4 inch axle provides the rugged base necessary to support up to a 600 pound tongue weight. Built from tubular steel and then powder coated, the trailer dolly is rock solid and will hold up for years. The 2 inch Reese ball hitch has a zinc coating and can be swapped out if needed. Ten inch flat free wheels ensure optimum performance on every pull. The American Cart Trailer Dolly has set the standard for the industry and continues to outperform the field.